WE PROVIDE THE REAL DEAL PROFESSIONAL GRADE GAFFER TAPE Gaffer Power Premium Gaffer Tape: *Is tough, powerful and secures cables tightly *Holds down wires to podiums and stages *Removes quickly and cleanly*Leaves no gummy residue, uses high quality synthetic rubber *Can be quickly torn into neat strips and used without other tools*Non reflective, blends it entirely with the background *Does no harm to what it is applied to*Excellent flexibility. We serve the industry professional. Film and TV Shoots, Studio filming, Theatre/Stage Production, Automotive industry, Sports Productions, Churches, Film Schools, Broadcasting Classes, Box-Sealing, Lighting & Audio/Visual Technicians, Photography, Floor Marking, Holds Down wires to podiums, Musical Gear, Microphones/Guitar Cables, Straps, Drums, Drum Sticks, Mixing Boards and Consoles etc.Great for around the house with lots of uses: *Can also be used for bookbinding, repair tape, wrapping, bundling, protecting, protecting wires, sealing tape, hockey tape *Can handle outdoor weather and a range of temperatures *Gaffer Tape is a must for anyone who wants great quality tape. What makes GAFFER POWER different than other brands? *Our tape is made in the USA and is NOT imported like many other brands on Amazon *Unlimited Value: Our customers stay with us for life as we never stop pleasing our buyers! We stand behind the quality of our gaffer tape and if you're not 100% satisfied with your purchase, we have a no hassle money back guarantee. Get Your Gaffer Power Now Before Stocks Run Out! PROFESSIONAL GRADE GAFFER TAPE - this tape is what the pro's use and matches up to any gaffer tape. your gear, cables, and surface are safe and intact- Whatever you use Gaffer Power on, it holds it. LEAVES NO RESIDUE AND EASY TO TEAR. You won't need any scissors as it can be ripped by hand with ease. Great for temporary applications as it won't leave a sticky mess when removed. PERFECT FOR LABELING - our white professional tape is ideal for markers and labeling your equipment. It stays securely on what it's applied to but easily comes off without leaving a sticky residue. 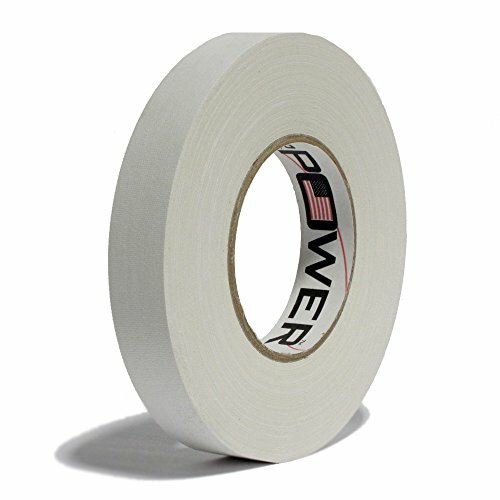 many household uses; secure computer or lamp cables, great for yard work, hockey sticks, window drafts, wall cracks, bug holes, you name it, Gaffer Power can do it! GREAT AROUND THE HOUSE, ESSENTIAL TOOL IN ANY TOOLBOX - the uses are endless; secure your computer, TV or any other cables down to the floor out of harms way; tape doors and windows to prevent draughts, secure boxes, fix appliances; Gaffer Power has hundreds of uses around the home, workshop, garden...it's even used for boat and car repairs. ORDER TODAY RISK FREE - 100% SATISFACTION GUARANTEE - We sell the best pro gaffer tape out there and offer a wonderful customer buying experience. We're here to help!